Arbors, pergolas and privacy screens are becoming more and more popular in our landscaping projects. The look of natural wood is hard to beat and it helps soften the look of your landscaping. An arbor, pergola or privacy screen can be a beautiful addition to any landscape. are very common, especially screens with horizontal wood slats. Privacy screens help provide a gentle semi transparent divider between you and your neighbours property. 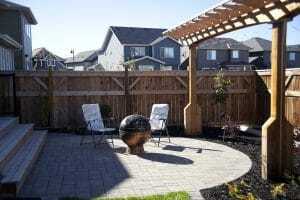 Privacy screens can also be used in front yards and around hot tub and lounging areas. We often install privacy screens on decks to help give privacy from neighbouring decks. The most common material used to build a privacy screen is cedar but you can also used pressure treated wood or meranti hardwood. 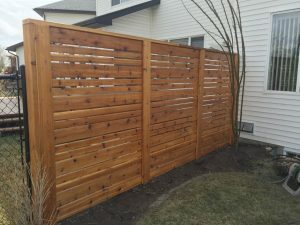 Adding and attractive stain to your wood privacy screen is key to bringing out the attractive wood highlights. 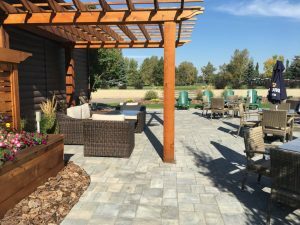 Chinook Landscaping and Design can build your privacy screen any height or length you choose and we would be happy to discuss all the possibilities with you. are built with cedar, meranti or pressure treated wood. We can build you an arbor in a simple or ornate fashion to complement your front or back yard landscaping.